I realize that I have already said something about this but I did want to keep with my still new premise about these kinds of films and offering up a posting series that I plan to have as a standard practice as more and more films of this type come out. With that being said I raise my voice to the top of the possible volume and yell “AVENGERS ASSEMBLE” Whew…. Well, almost time that is……. Back in May of 2011, The CW Network aired the final episode of “Smallville”, the television series that followed the adventures of a young Clark Kent during the years before he became Superman. 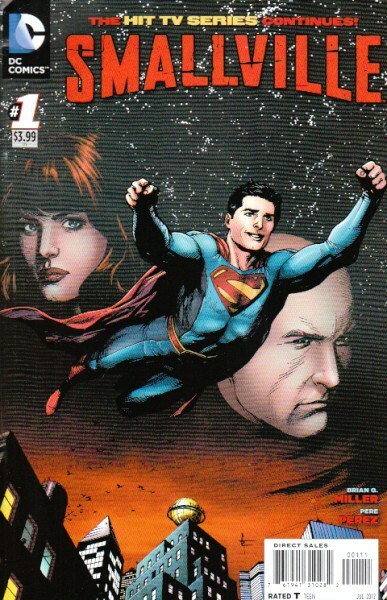 Now just under a year after the ending of the show, the characters and its world continue on anew in a brand new comic book titled “Smallville Season 11”. Check out the cover. For this who are interested, today is the opening day for the new Science Fiction film entitled “Battleship”. As you might have guessed it is loosely based on the board game of the same name. Now I am not too sure on how one actually gets a film out of a game like Battleship but having seen the trailer it does look interesting and pits our armed forces against an alien threat. I will not likely catch this in the theaters myself since I am anxiously preparing for the release of “Marvel’s The Avengers” which opens next month. What are your thoughts about this film or its premise? Will you see it on the big screen or wait until Netflix or some other means of viewing? Can you believe that my Metal fiends? Yep, it’s the Big 10th Season for a Metal program and that is pretty cool in my humble opinion. Of course let’s immediately get this out in the open that the show while running for ten seasons has never had a season that showed more than ten episodes and its only been on the air since November 2008 which is not quite four years as of this posting. If you were to use shows like “Big Bang Theory” or “CSI” as an example, their first seasons were 17 and 23 episodes respectively. In addition to that there are many fans who feel this is more of a Hard Rock show than it is a Metal show and I can see where they come from based on some of the episodes that I have seen. These fans should try to realize that this is on VH1 Classic and that means we are not going to see Behemoth, Dimmu Borgir or Kamelot on any time soon. For those in the dark or returning from a faraway land and needing some background on the program, the show is now an hour in length and hosted by radio personality Eddie Trunk with comedians Don Jamieson and Jim Florentine as his co-hosts. It features an interview format along with a few special segments that allow the hosts to banter at length. There is a live musical guest who brings them to commercials and while its been guitarists and bassists since they started, with season ten they shall bring out guest drummers. As a former hobbyist skinbasher I kind of like that idea. The later seasons actually found the hosts interacting with this guest more than they did in the earlier broadcasts. Outside of that there is no true musical guest performer doing a song from a new album or anything. It’s probably a cost issue. Oh yes, the show is recorded in Los Angeles as opposed to New York City where it started. So what does everyone think of the show so far? Are you loving it? Are you hating it? What parts make you feel a certain way and what do you wish they would do differently? Me? I guess I can admit to liking parts of the show but I agree with those who feel there is too much banter time happening but that is to be expected when you have three hosts. Losing a little of that might allow for longer interview time and that benefits the artist and the fans that are interested in learning what is up all the more. For me as a supporter of the Metal scene I don’t find a lot of the bands that I consider of vital importance to the sound today being represented but I don’t really expect them on VH1 Classic anyway. Yes I love the old stuff but as many Metal fans point out on the forum board sites and news feeds, we don’t need a show to tell us how Judas Priest, Alice Cooper, UFO and Thin Lizzy are bands that we should be listening to. Yet for those fans who are locked into the traditional side of things the show rules since it caters right to that preference and only deviates every once in awhile. It’s nice to have something related to Metal on the air, but I still very much miss Talking Metal on Fuse and hope we find something new and perhaps even edgier coming on somewhere soon. I’ve met Eddie Trunk a number of times on my own adventuring around the Metal Realm, so I do send congratulations to him on the 10th Season. It has to be a nice feeling. Here is to your 11th, 12th, 13th and etc. Watch Full Episodes HERE if you are curious about it. Comments are open on this post to let us know what you think about the show.